Small Bounce House for the Wee Ones Ages 1-3. 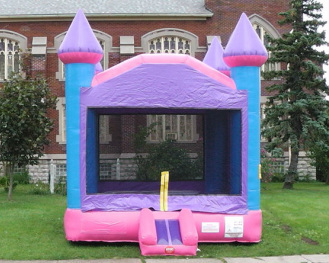 Our 15'x15' Princess Bounce House is the perfect size for your child's next party or event. Our 15'x15' Rainbow Bounce House is the perfect size for your child's next party or event. This 22'x18'x16' 3 in 1 combo unit has a Basketball Net, Large Bounce Area, Climb and Slide all built into one Giant Castle. This is a crowd pleaser for any occasion. This 22'x22'x20' awesome multi-colored 5 in 1 combo is sure to be a hit with your guests. It has a Large Jumping Area, and a Basketball Hoop on the inside as well as the outside. A Obstacle Course Area and also a Climb and Slide. This Obstacle Course has a Tunnel, Climbing Wall, Slide, as well as other Obstacles to get pass. Definitely will be a hit for any event! ​And exciting enough that kids love to get on and slide all day long! Challenge your opponent without the court! Let’s see who can make the most baskets. It features two basketball hoops and comes with balls. Does not include electronic scorekeeper. This interactive bounce house is 10'x9' and 7 1/2 feet tall!! Come pick this item up and save the $50 delivery fee.